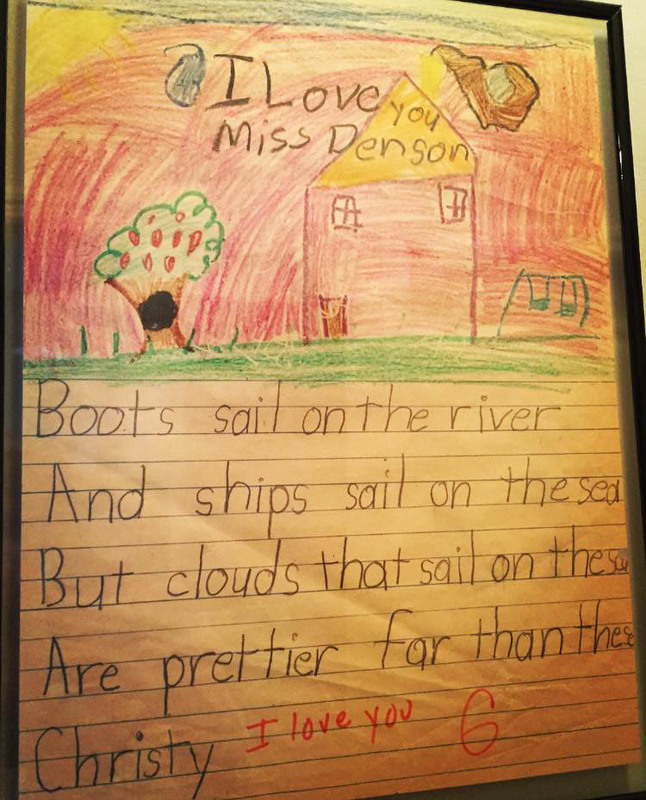 I know there are grammatical errors (boots on the river?) and my illustration is not the most accurate, but back in the day, we created one of these papers every single morning. If you’ll please notice my handwriting. This picture makes me tear up. Not because I’m nostalgic for first grade (I am, though) but rather, because my first grade handwriting is neater and better formed than my son’s who is in fifth grade. And yes, maybe I was a naturally better writer than my son, but I also practiced every single day. Thank goodness, one thing that is still intact in our current school system is the love the teachers have for our kids. I knew Ms. Denson loved me even if she hadn’t replied to me in her beautiful red ink. Ms. Denson would never have time for that now. She’d be too busy fitting in her material for the day, to teach kids how to take tests. Ms. Denson has been replaced by a black rectangle that gives a little “good job” graphic in the corner of a screen. Somehow, I don’t think that praise feels the same coming from a computer. I know a screen shot from my son’s computer, telling him “I love you” won’t be hanging on his wall in 30 years.